Black diamond, the most precious and rare amongst truffles, finds its way into Estée Lauder’s prestigious Re-Nutriv Ultimate Diamond Sculpting/Refinishing Dual Infusion. Despite ideal conditions, it can take up to ten years for a tree to start generating these truffles, and growth patterns aren’t necessarily consistent from year to year. Only harvested from December to March each year, these can command high wholesale prices ranging from 900 to 1,500 euros per kilo. Thus, only a limited number of Re-Nutriv infusions are produced in a year. The soil-to-bottle process of procuring this precious elixir begins in a small town in south-west France, where Estée Lauder’s master truffle grower embarks on a journey at sunrise to uncover this highly-valued truffle. The brand takes care not to ever freeze or dry the truffles in order to fully capture and preserve their nutrient-rich composition. Finely ground, double filtered and ultra purified to preserve maximum potency, it takes about 10 to 15 kilograms of the raw black diamond truffle to yield just one kilogram of pure extract. 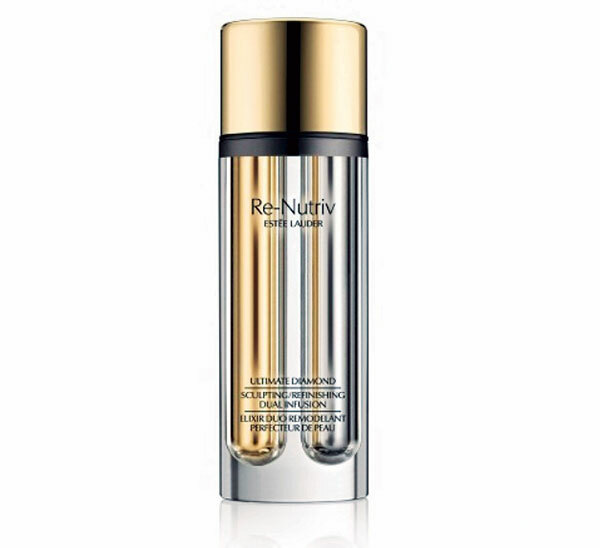 Once blended with refined 24-carat gold and some of the most advanced youth-sustaining technologies for firmer skin, the extract finds itself in a golden vial. The adjacent platinum one contains powerful ingredients including South Sea pearls to refine the skin’s texture. With a single pump, both vials combine for a groundbreaking age-reversing solution with a light, floral scent. Skin looks firmer, more sculpted and strikingly younger. Native to Corsica, a French island in the Mediterranean Sea, this immortelle flower is fascinating as it never fades, even once picked. Due to its incredible longevity, Helichrysumitalicum, as it is scientifically known, has been used since ancient times as a beauty secret. During the 20th century, the amazing properties of these golden blossoms were unravelled in the field of herbal medicine. Since then, it has been increasingly used to prevent skin conditions such as acne or eczema. Immortelle essential oil, rich in active molecules, delivers unique anti-ageing results, a fact that L’Occitane, a company known for preserving the beauty traditions of Provence, recognised. 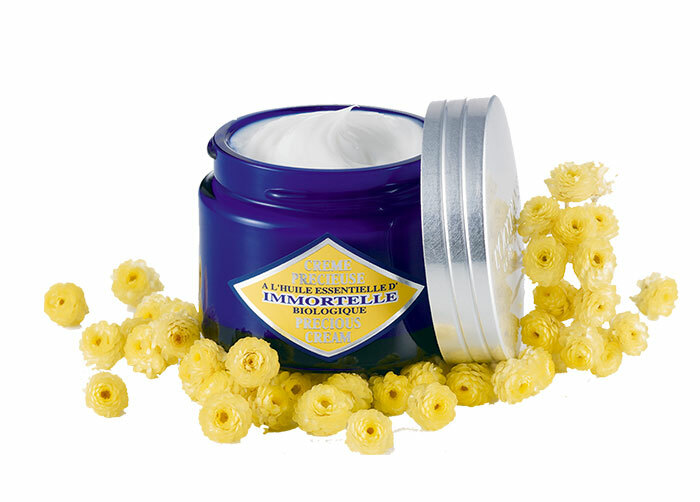 Patenting the exceptional powers of the Corsican immortelle, L’Occitane built its anti-ageing skincare line around it. To ensure the highest quality of these radiant flowers in its formulations, L’occitane invested in a large-scale and sustainable immortelle plantation in Corsica. Fifty hectares of these flowers were cultivated using organic methods to protect the natural environment and encourage biodiversity. The soon-to-be launched Kiehl’s Iris Extract Activating Treatment Essence, a highly effective cosmetic water, delves into the depths of the earth for inspiration. A star of herbal medicine, the roots of Iris Florentina are rich in nutrients and act as a unique reservoir of energy, allowing its flowers to bloom thrice a year, and thrive in the varied Mediterranean climate. The root is also abundant in flavonoids, a powerhouse of antioxidants and natural UV filters. Hand-harvested from spring to autumn, the root is carefully cleaned, peeled, dried and processed to yield a purified, nourishing extract. “The Iris Florentina root is known for its strength in nature, and we were pleased to discover its anti-ageing benefits,” states Dr Geoff Genesky, head of Kiehl’s skincare laboratory, talking about the extract’s ability to improve the skin’s youthful appearance. Building on its rejuvenating power, Kiehl’s latest offering, deeply penetrates the skin to boost radiance, reduce fine lines and improve dullness. This essence is meant to be used after cleansing to increase the efficacy of serum and moisturiser. With its 30,000 listed species and its lifespan of sometimes over a hundred years, the orchid is known for its ability to withstand environmental attacks and regenerating prowess. To create its opulent anti-ageing range, Orchidée Impériale, Guerlain spent a decade on research to understand the secret behind the flower’s longevity and correlate the findings to improve human skin texture. The brand’s conviction that the potential of plants is greater in their natural habitat led to the construction of the Orchidarium, an elaborate research platform consisting of three centres across continents. Its Experimental Garden, in Switzerland, gathers together a unique collection of orchids, from which the most durable are selected. These orchids are protected and cultivated in their natural environment at the heart of the Tian Zi Biodiversity Nature Reserve in China. In France, its Basic Research Laboratory collects the samples sent by the previously mentioned centres. It is here that each specimen’s messages of cosmetic interest are identified, deciphered, compared and quantified. 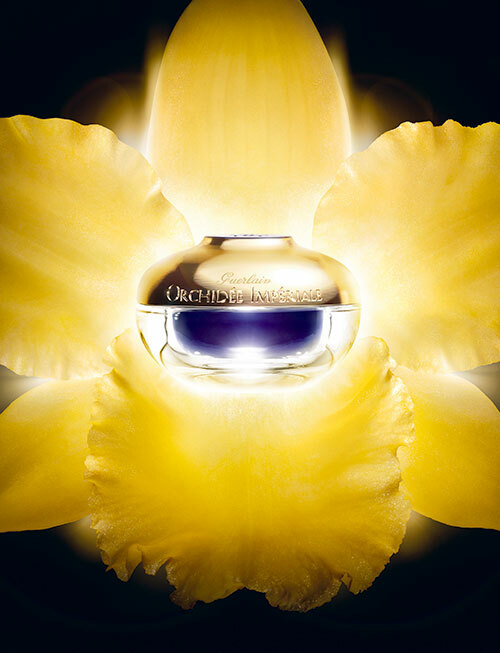 For its latest offering, Orchidée Impériale The New Treatment, Guerlain harnesses the power of gold orchid, a species which grows in the treetops four or five metres above the ground and takes seven years to mature. Its medicinal benefits have been known for over 1,500 years. Gold has been referred to as ‘the key to youth’ in Ayurveda, due to its beautifying and healing properties. The Puranas indicate that goddess Lakshmi had turned Rati, Brahma’s daughter, into the most beautiful woman in the three worlds, with the use of pure gold. 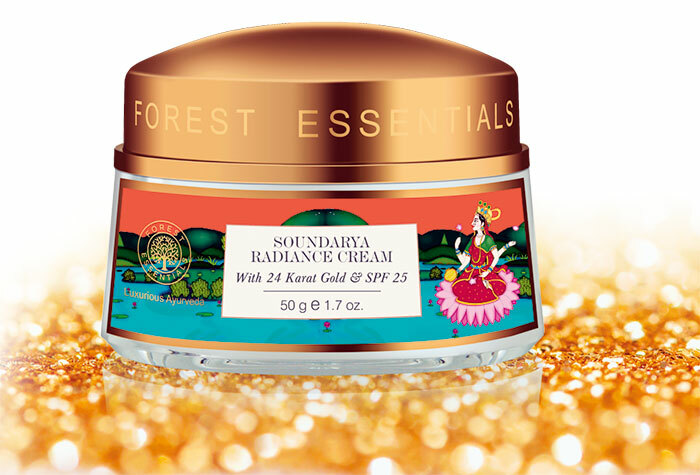 Forest Essentials’ Soundarya Radiance Cream uses 24-carat gold bhasma (ash) in combination with ketki flower infusion and saffron to control collagen depletion, increase skin elasticity and smooth fine lines. Mira Kulkarni, founder of this luxurious Ayurvedic brand, takes pride in mentioning that the pure gold bhasma is prepared according to the tenets of rasa shastra, the branch of ancient Ayurveda which explores the artistry of combining metals with medicinal herbs. “Gold is a renowned yogavahi metal that gets easily absorbed into the skin, protecting it from sun and environmental damage, and working as an age-defying agent. It penetrates into the deepest layer of the skin, giving it a luminous burnished sheen,” states Dr Ipsita Chatterjee, Senior Manager (training), Forest Essentials.